I’ll admit, I sometimes get into a dinner rut where I keep on making the same 3-4 recipes again and again each week. What helps me think outside the same-old, go-to recipes are fun ingredients and different flavors that I would maybe eat at a restaurant, but not necessarily make at home. 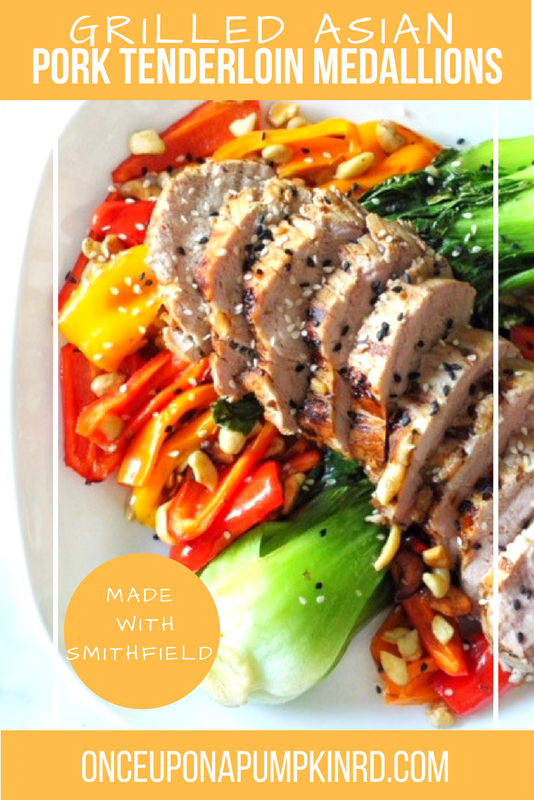 That was the inspiration for these Grilled Asian Pork Tenderloin Medallions made in partnership with Smithfield. 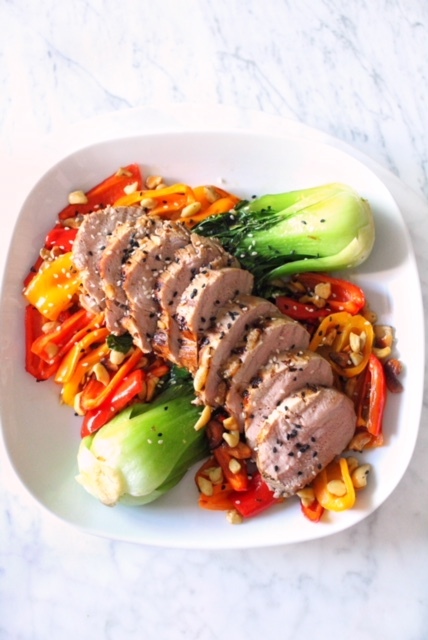 The tangy Asian flavors of sesame, ginger, red pepper and cashew complement the Pork Tenderloin for a nutritious and delicious, easy to make, weeknight meal in just under 30 minutes. 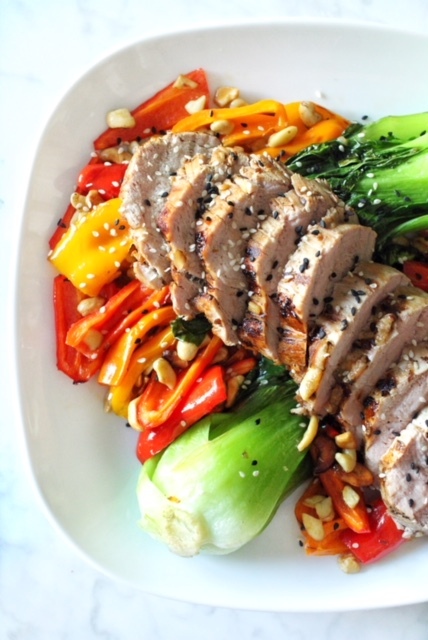 The Smithfield Fresh Pork Tenderloin is juicy, tender, and really paired well with the Asian flavors and roasted vegetables. Smithfield Fresh Pork is a good source of vitamins and minerals including potassium, riboflavin, and zinc, and an excellent source of vitamin B6, thiamin, phosphorus, niacin, and protein. One three-ounce serving of lean fresh pork is a high-protein option, providing 22 grams of protein and only 120 calories. Not to mention, Smithfield Fresh Pork Tenderloins and Sirloins are recognized as a “heart-healthy” food by the American Heart Association. As a dietitian, it’s really important to me not only to eat nutritiously, but to make it fun at the same time. This is definitely a fun recipe and creative take on fresh pork that has me thinking about making it again already! I recently had the opportunity to visit the Smithfield Foods farms in North Carolina, and I can honestly say that Smithfield is passionate about producing good food the right way. Their business centers on sustainability, the humane treatment of animals, stewardship of the environment, producing safe and high-quality food, the vitality of local communities, and creating a fair, ethical, and rewarding work environment for their people. I saw this shine through during my experience on their farm and the extreme pride that all of their employees had for their job and the care of their animals. I also must say as someone who constantly craves Asian takeout—this recipe will satisfy that craving in a healthy way. For a spicier version, add 2 tbsp. chili paste to the marinade! I also think it would be great served with water chestnuts and carrots! You can find Smithfield Fresh Pork products at Mariano’s and select grocery stores nationwide. For Smithfield Fresh Pork nutrition tips, more information, and endless recipe inspiration, visit www.Smithfield.com. 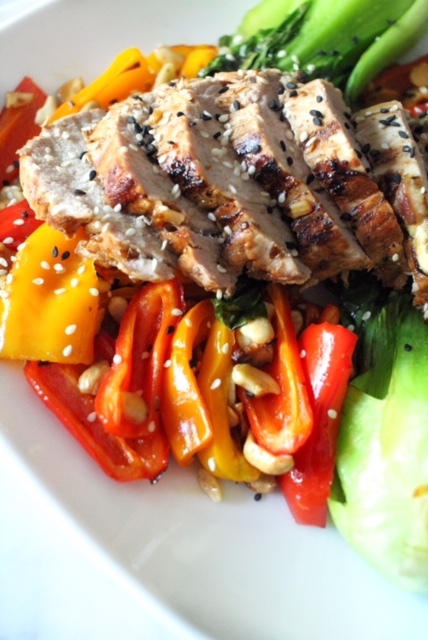 Also be sure to check out this other equally delicious pork recipe I whipped up not too long ago! Combine all marinade ingredients in a large plastic bag. Put the pork tenderloins in a large plastic storage bag and mix in the marinade. Stir the bag until the pork tenderloins are fully covered in the mixture. Heat a large nonstick skillet or grill to high heat. When the skillet/grill is hot, add the pork tenderloins. While the pork tenderloins are grilling, wash and chop peppers into strips. Toss with olive oil and cashews, then bake in the oven at 400 degrees F for 10 minutes. On a skillet over medium heat, add water and bok choy. Cover the bok choy and let steam for about 2-3 minutes. Grill the pork tenderloins, turning several times, for 25 minutes, or until a thermometer inserted in the thickest part reads 145 degrees F.
Remove the pork tenderloins from the grill and let rest for 5 minutes. Slice the pork tenderloins diagonally against the grain. Serve on top of bok choy and pepper and cashew mixture.